Create Your Free Starter Account! Hello! My name is Nathaniell. I've been earning money online since 2010. Before that, I was an ESL teacher in Europe and China. 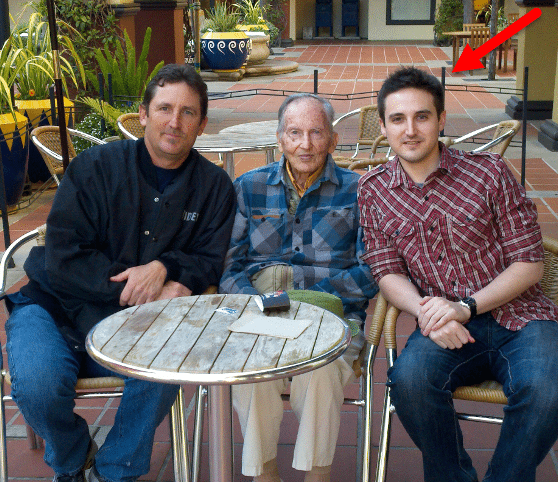 This is me hanging out with my father and grandfather when I returned to the USA after living in China for 5 years. I started my first online business as a hobby, and decided to move back to the USA after I was making enough money to quit my job! I didn't go to college for computer science, web design, or marketing. In fact, I didn't go to college at all. I taught English while traveling for about 10 years before I started to realize that teaching English overseas without a college degree was a dead end job, and I started to look for alternative types of employment. I considered driving big rig trucks, going to bartending school, learning how to be a private detective, or even being a fireman. They were just ideas, and I never took action. Eventually the idea got into my head that I could start an internet based business. I didn't know what to sell, or how to start, and got very frustrated. All these programs said I could make money fast, but they all turned out to be more difficult than I expected, or flat-out scams. After trial and error, I discovered the truth sitting right in front of me. If I wanted to make money, there was no easy path. I was going to have to get busy and get to work. Within 18 months I was making over $10,000 per month, and I didn't even have to recruit anyone to my “team”. I was a one-man show, selling computer software subscription online. The good news? I'm going to show you exactly how this whole thing works on this page. The best news? You can promote any products you want! Right now it's 2019. My personal goals have changed from traveling and adventure, to settling down in a cozy home, going to the gym a few times a week, brewing beer in my free time, and enjoying not having to work so damn hard! What I do is called affiliate marketing. Keep reading, and I'm going to tell you how much money you can make, how the process actually works, what concrete steps you need to take to get started. If you asked “how much money does a restaurant make?” or “how much money does an app make?”, the answer would be the same. It depends on many factors. A mom-and-pop café will make less money than a fancy steakhouse, but a chain of fast food joints will earn more than both of those! Likewise, with affiliate marketing, a hard worker will earn more than a slacker. Someone that dedicates five hours per day to building their business will earn more than someone who dedicates only one hour. These were my first affiliate commissions. See how I started by earning just $23, and within one year I was earning over $5,000 per month from this one affiliate account? These amazon earnings are more recent. In 2017 I earned over $9,000 from a “side project”. Part of the power of affiliate marketing is that you can diversify your income so that you are never reliant on just one source of income. This makes your online business even stronger and more stable than a traditional job. Anyone can ​repeat what I've done. It doesn't matter what race, age, religion, or gender you are. You don't even have to be that smart! LOL. I didn't study this stuff in school. I'm not even that good with computers. Question: How do you make money with affiliate marketing? I make small websites about very specific topics people search for online. When someone types something into Google, they can find my website and read my articles. Sometimes the the articles link to products. If someone clicks that link and buys something, I make some money. Millions of people are searching the internet for information right now and where do you think all these information websites come from? People just like you! They are building websites, writing articles, and earning income from it. Some of them are making a lot of money. …it's time to get your piece of the pie! There are different ways to earn money from a website but making affiliate sales is the same method method I use. This is what I like to teach people because I can just show them the same process I did. Affiliate Marketing is my favorite way to earn money on the internet for a few very clear reasons. One of my hobbies is brewing beer at home. I'm not an expert brewer, but I love making beer (and drinking it!) So last year I started a website about it. Homebrewing is my passion. What's yours? On this website I talk about a lot of different things related to homebrewing. I teach people how to pick the right equipment, how to put together a recipe, and how to fix mistakes in the brewing process. 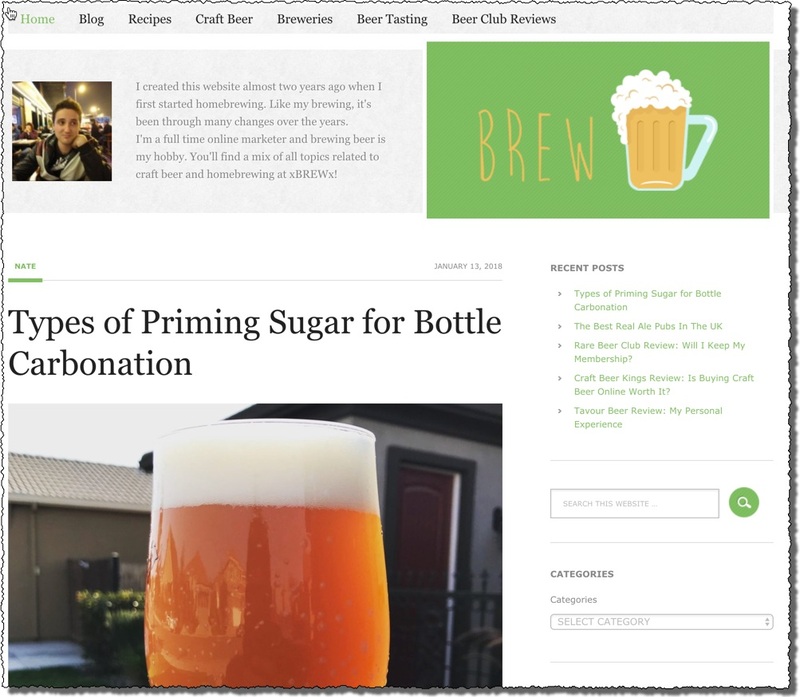 In the example above, I link to a company which sells a membership called the “Rare Beer Club”. The membership costs about $50 per month, and I make $12 commission for each membership I sell. Here's another example called MotionSensorSprinkler.com. Last year I had feral cats messing up my lawn and I got so mad I made a website about it. In this website, I talk about different methods of keeping unwanted critters out of your yard, including bugs, cats, raccoons, and deer. Anyone who ever had a deer eat their rose bushes knows how frustrating it can be! If you had some gophers digging up your beautiful vegetable garden, what's the first thing you would do? You would go to Google, and search “how to stop gophers from digging up my vegetable garden”. Websites just like mine rank, give advice, and recommend products. 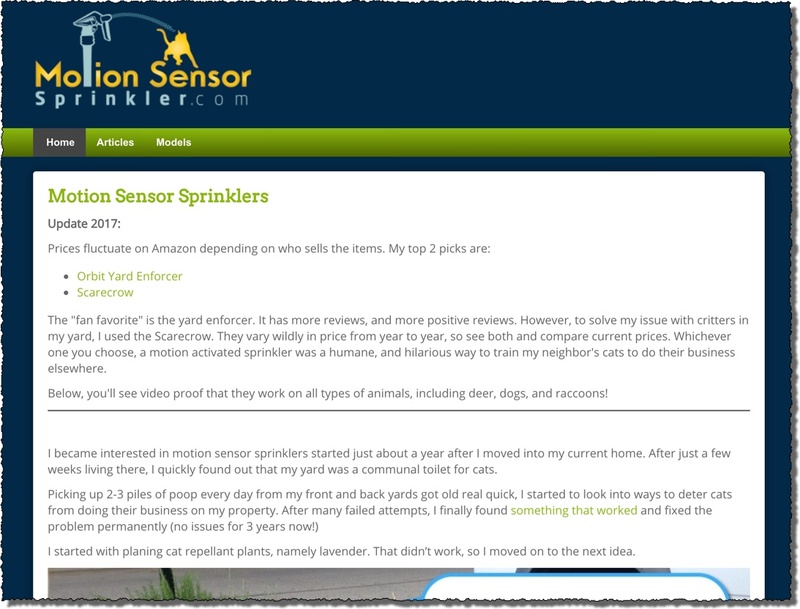 This sprinkler website earned almost $500 in February! Crazy examples right? I'll be you didn't know that beer and sprinklers can earn money online. So I can guarantee that any topic you think of will earn you money online too. There are thousands of websites like this on the internet about every topic you can think of, and many of them are generating income for their owners. You can create a website like this about ANY topic you want. Here are just a few ideas. Pick Your Website Topic & Start Building! The main method I used to promote affiliate links is by writing articles for my website. This is my favorite method to teach newbies because it's free. All you need is spare time. It's not like other business models that require inventory, staff, or renting an office space. As long as you have a computer, you can make money with this method. If you can write, you can rank. ==> If you can rank, you can earn cash money baby! Writing an article that ranks in Google does take practice though. 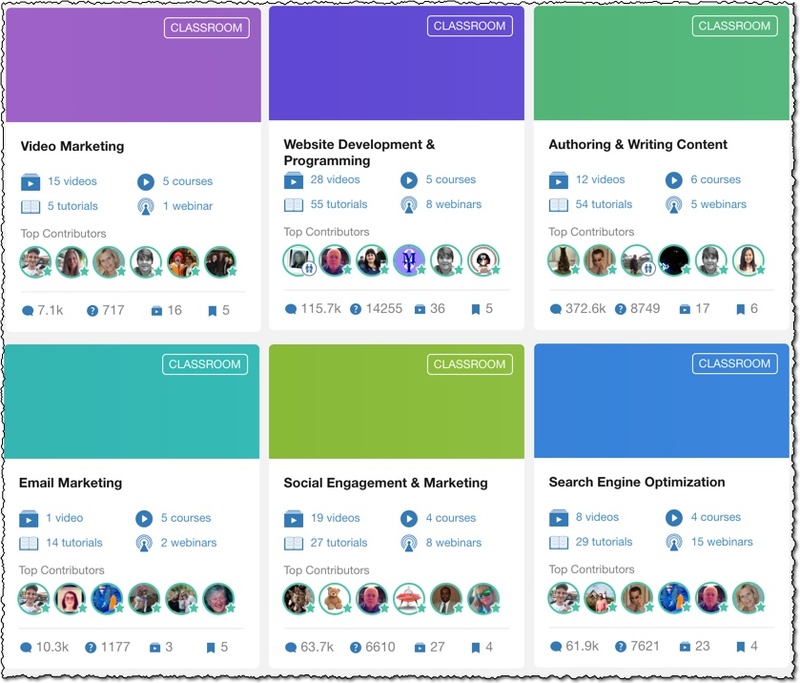 You won't be a professional online marketer by this time tomorrow, or even next week. Over time, I will write hundreds, or thousands of articles on this topic, so I'd better pick something I really want to learn about in the next few years! Step 3 is to link to products! With about 10 minutes of research I found a couple companies that pay between 4% and15% to promote their coffee products! Some home coffee roasters on Amazon that sell for $300+ and will make me 4.5% commission. Some companies, like computer software companies pay 75% of the sale to affiliates. 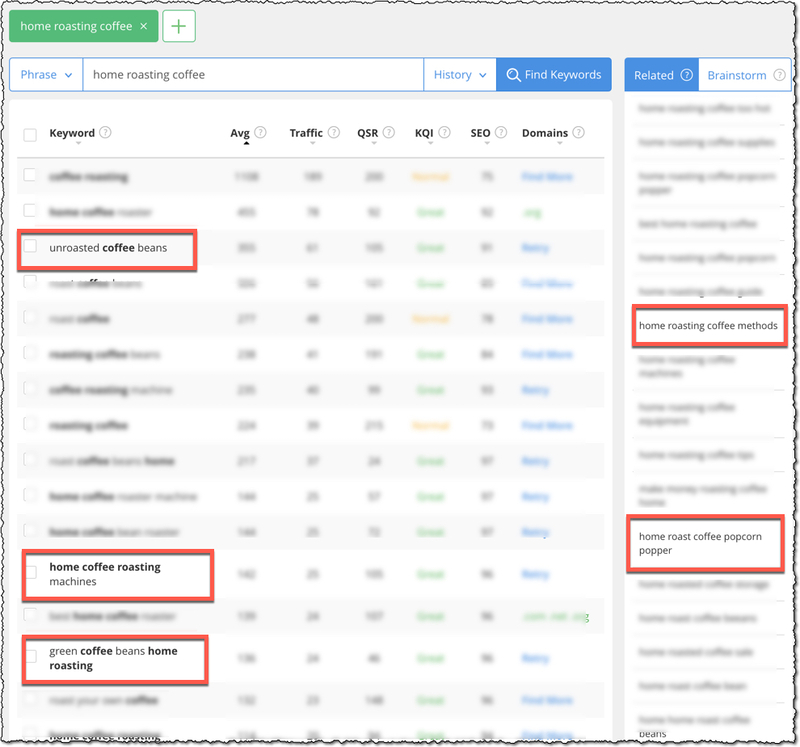 Continuing with my example above, in my article about roasting green coffee, I can find green coffee sellers and promote their coffee on my blog. In an article about home roasting coffee machines, I can promote my top 3 favorite home roasters. After I sign up for those affiliate programs (they are free to join), I just place my affiliate links in my content, and it automatically tracks sales. What If I Don't Have Any Good Website Ideas? The truth is, ANY website can work. People search for everything online. That being said, the most popular topics, which will always have tons of traffic and money-making options are Health, Wealth, & Love. Here are some basic ideas to get your creative juices flowing. …and the list goes on! The main thing to keep in mind is that your first website doesn't have to be perfect. It doesn't have to be a home run with your first try. I started three or four failed websites before I really got into the groove and picked a topic that worked for me. My very first websites was about horse care, and it didn't last long. My first successful website was about computer software! If this is your first website, don't put so much pressure on yourself. Just use the first idea that pops into your head, and you can always start a new site in a couple weeks or months. Can You Teach Me How To Earn Money With My Website? I'm a Newbie! Remember, I started out just like you. I was a total newbie! I also had a terrible internet connection and a broken laptop. I didn't even have a desk to work on while I was living in China. I'm living proof that even total newbies can make money online. Of course, success won't come overnight, but if you are willing to follow the same steps I took, and dedicate at least a couple hours per week to building your business, then you will see results. Start Your First Lesson Right Now! When I was in China and looking for ways to make money online, I didn't just start a website and become an instant success. I fell for a couple “get rich” scams first. Then reality hit me. I read an article about Wealthy Affiliate and how they were teaching people step by step how to build internet businesses. The strange thing was, they did not promise me riches, and did not guarantee me success. This website said I needed to work hard, and work consistently. I was going to run into some frustrating things along the way, but there was a community of experienced entrepreneurs that would help me figure out the hard stuff. Wealthy Affiliate helped me make my first sale online. After three months, I made an amazing $5! Amazing, right? Not really. Five bucks certainly isn't a full time income. But it was PROOF that I could actually do this. With the the training and personal help at Wealthy Affiliate I was able to create my first profitable website. After that, they showed me how to turn my first sale into consistent, reliable income. After 18 months I quit my job in China and moved back the the US to work from home. Here's me working, and here's me adventuring out in the mountains! Take a look at one of my first posts in Wealthy Affiliate in 2010, just a few weeks after joining. Yes, I was a total newbie…not making any money yet! I tracked my progress every year. Although there were many frustrating moments when I wanted to give up, I kept doing more training and building my website bigger and bigger. Once I started seeing some tiny results, I really kicked it into overdrive. 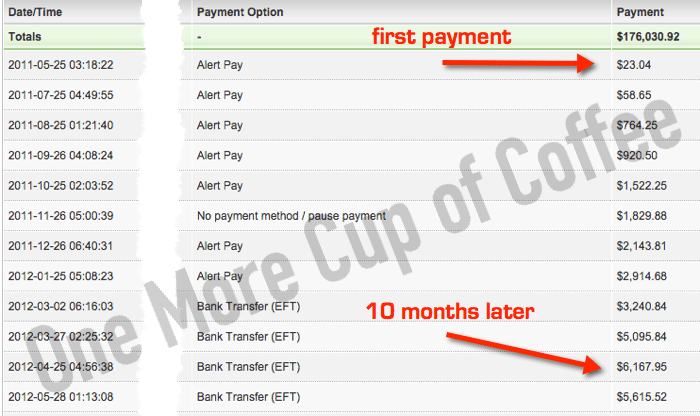 My first sale was only $5, but within 18 months I was making $11,000 per month! Here is my 2 year anniversary post from 2012. Less than a year later, I had quit my job to “go full time”. I've been working online full time for about 7 years now. I think it's pretty obvious why I give Wealthy Affiliate so much credit for helping me succeed online. Plus, consider this: Even though Wealthy Affiliate was great back then, they are even better now. You new guys have it easy! In fact, they just recently made it completely free to join the website so you can see the training and meet other members before you pay anything at all. Your internet business isn't going to happen overnight. Sorry to disappoint, but you are going to have to get your hands dirty and work. If you can handle that, let's take a look at how exactly they are going to help you start earning money online. The training courses inside Wealthy Affiliate are second to none. Most other “make money online” are a simple ebook or series of videos. Pay one fee, get one product. 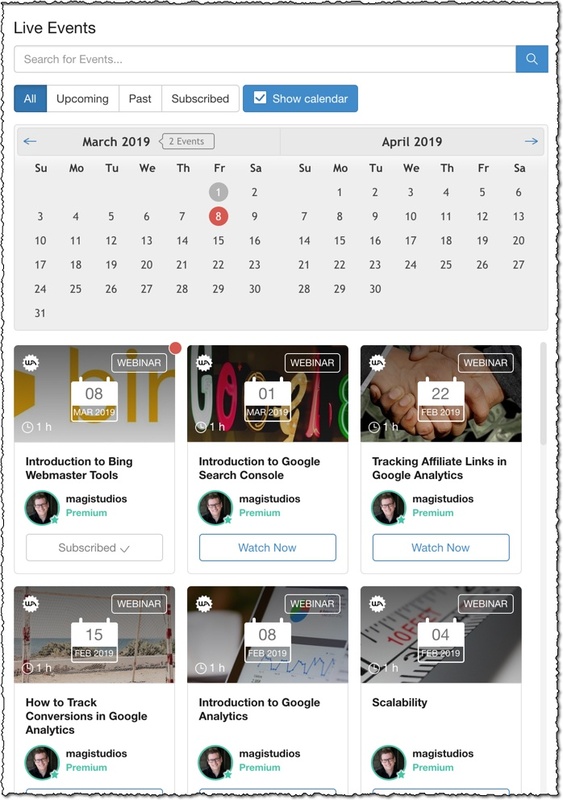 The core training is updated to reflect changes in the industry so you can make sure your website stays ranked in search engines, generating traffic and revenue. 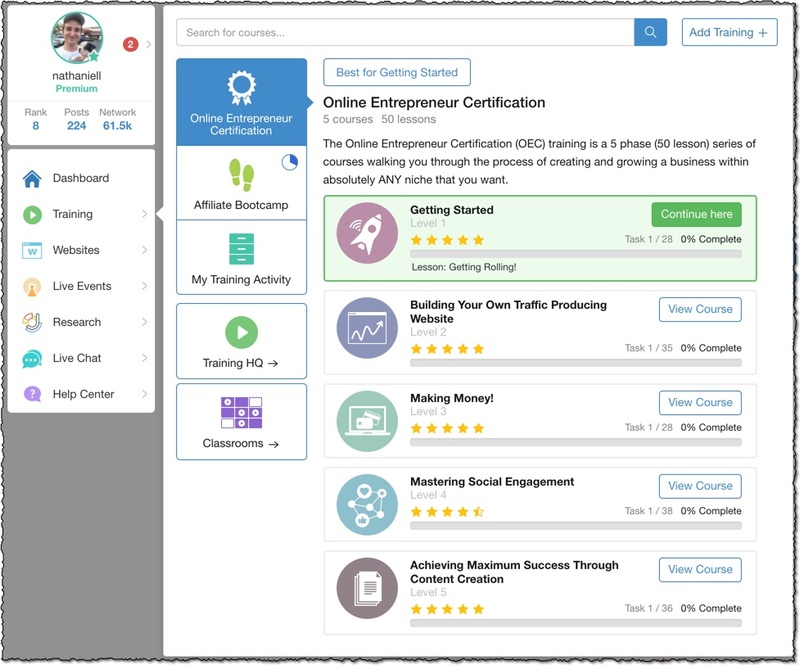 Plus, there are over 500 training modules within the community covering everything building your very first website to learning how to start outsourcing parts of your business. I have reviewed hundreds of products on One More Cup of Coffee, and no other company in the world offers the quality and style of training offered inside WA. You will make some mistakes along the way. There will be times when you are confused. That's OK. But who's going to help you figure out what went wrong? Live help from the the community is going to be the best way to get fast help when you need it. Instant and friendly help is something that will keep you moving in the right direction. You will not have to spend days searching for answers that don't quite fit what you are looking for, or hours scrolling through old forums and blog posts trying to figure out things by yourself. Now you have hundreds of personal assistants that can show you what to do next! Got a tougher question? Send me a private message. I log in every day and am here to help you make money from your website. I've been a member for almost 10 years now, and have generated over a million dollars in online sales. I can definitely help out! Wealthy Affiliate contributed tons to my success as business owner. But I am not the only one. There are thousands of other people inside the members area that are currently running their own internet based businesses. Some are millionaires. Some are grinding to build their business just like you. Read their blog posts and learn from their experiences. Ask them questions and get 1-on-1 help. Mentorships with other companies can cost you thousands of dollars per month, sometimes even more than $1,000 per HOUR. I'm not joking. I'm inside every day helping other members, and I can help you too. I take time out of every day to answer questions people ask me. Yeah buddy, you'll get personal 1-on-1 help from me. Just send me a message and ask me something. Try it out!. Here are a couple amazing responses I got from members I've helped out (printed with their permission). I just really want to stress the fact that I'm actively involved in the community, and I will be available to help you get your business off the ground. Wealthy Affiliate is not one of those websites that wants you to pay up front to “learn the secret” of making riches online. If you've read this entire page, you already know the core concepts of what's inside the training. Still, it's pretty scary joining a “how to make money online” style website. How do you know this isn't some kind of scam? So to show you exactly how awesome the training is, and exactly how fast support is, and exactly how friendly everyone is, you can create a free Starter Membership. With this free membership, you'll be able to build your first website and ask unlimited questions. Kyle (the owner) will show you step by step how to pick a topic for your website, how to build your website, and how to create your first articles. Everything I talked about above; the live chat, the step-by-step training, and access to other successful internet business owners is available for exactly $0. They don't even take a credit card. You can access all of these things for a full 7 days, and then you have the option of upgrading to a premium membership. You get to keep the free website even if you don't upgrade! Now that you built your first website, took the Level 1 training course, and even used the live chat feature to ask some questions, what's going to happen next? Wealthy Affiliate also offers a Premium level of membership. At this point, let's be real. All of that stuff sounds nice, but it's probably not super clear what everything does or why it's important. That's why I try to focus on the #1 most important thing about Wealthy Affiliate: the help you get from the community. Just about every "make money online" product out there is basically a PDF guide or a video series, or maybe an empty Facebook group. The best thing about Wealthy Affiliate is the thriving community of people who are there to help you build your business. Notice how question are being asked every hour and they already have responses? 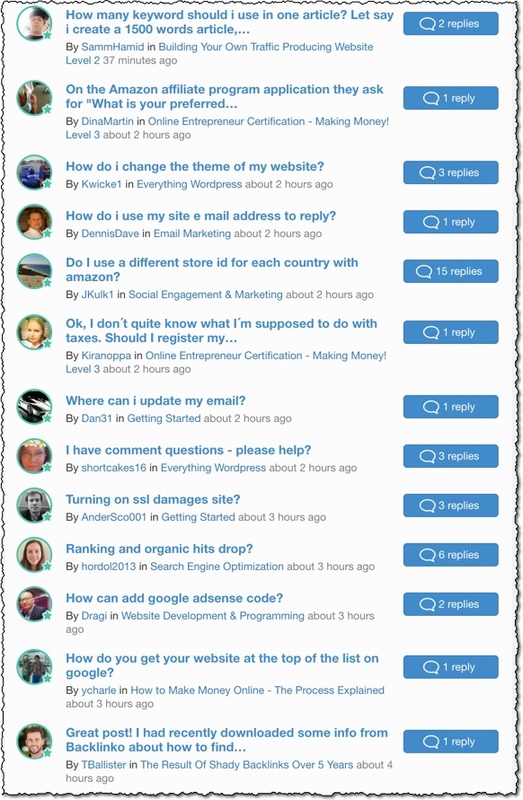 Popular questions can get hundreds of replies! Every week Wealthy Affiliate hosts a live training session that covers a wide variety of topics. All webinars are designed to grow your business in different ways, and help you earn more money from your websites. 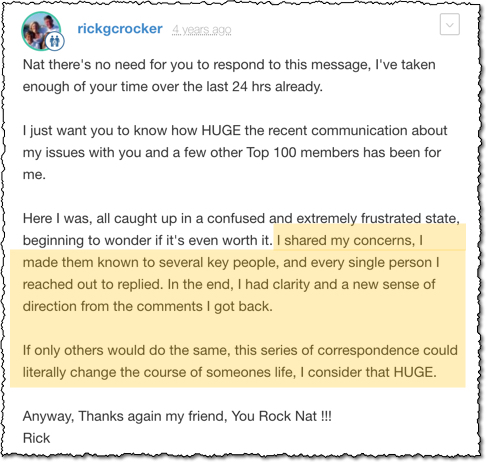 Sometimes they even do a live critique of member websites (learn from their mistakes, or repeat their success). 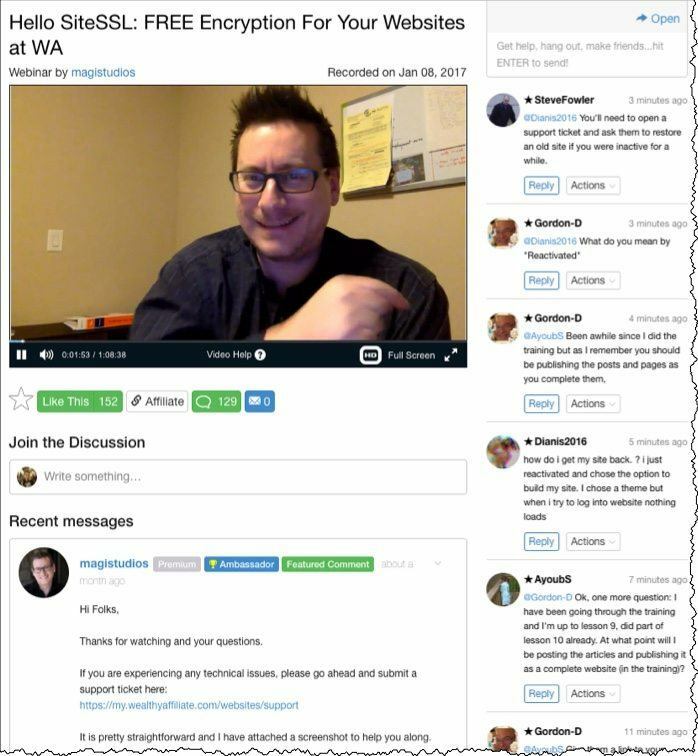 Even if you are already earning money from your websites, the live webinars are a good reason to stay a WA member long-term. It's a big reason why I'm still a member. You can stay up to date on all the online business news, and make sure your site is going to outrank your competitors! Recently, Google changed to prefer encrypted websites instead of regular http websites, so we all learned how to install SSL on our websites. It's a lot easier than it sounds! Webinars happen every Friday. Topics are announced during the week. Sign up now and you can attend your first webinar before the end of the week! Ask questions LIVE in chat if you have any trouble with the material. There are NO SALES PITCHES in the webinars! Why pay $100 per webinar anywhere else when you can get them for FREE with your Wealthy Affiliate membership? Sign Up And Watch A Webinar This Friday! If you couldn't tell by the title of my site, I'm totally not a morning person. Now I don't have to wake up at 6:30AM and drag myself out of bed to go to a dead-end job. These are the things that are important to ME. Let's talk about YOU and what you can get from starting your membership today. Do you want more time with your family? Are there places you want to go and things you want to see? Do you no longer have job security, or even hate your job? Are you starting to plan for retirement and need an extra source of income? Wealthy Affiliate is an investment in your future, and an investment in yourself. Wealthy Affiliate is the road map to owning a profitable online business. Premium membership is only $49/month. No secret upgrades. No expensive mentorships. No surprise payments. That's only $1.56/day to build your own profit-generating website! Many people spend $5 a day on Starbucks coffee or $100 per month ($3 per day) on cable TV. These consumer items do not better our lives! 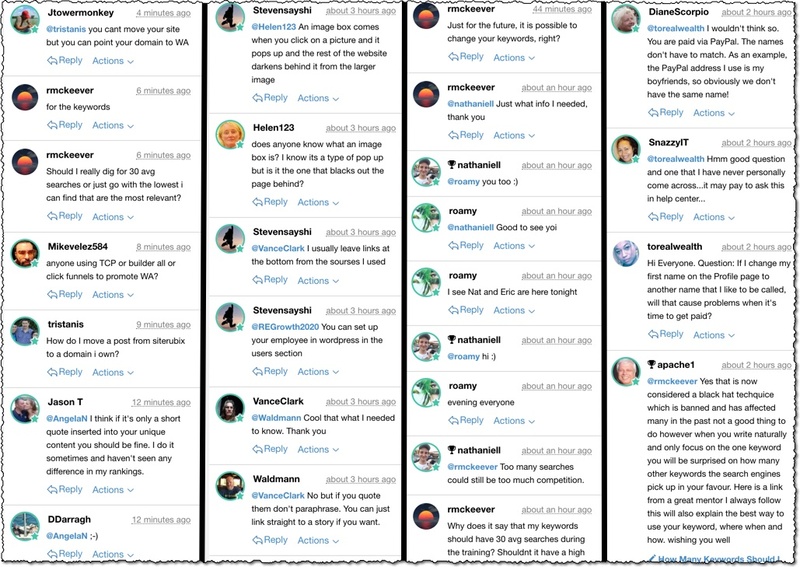 For a buck fifty, you can access a thriving community of internet entrepreneurs that want to help you build your first internet business. The internet is reaching more and more people every day. Millions of people are shopping online, and that number is only growing with every passing year. It is simply not true that all the good ideas are taken, or that you ‘missed the train'. There literally 10,000's of opportunities to make money online that pop up every day. Every time a new product goes on the market, that's a new opportunity for you! Every time a business owner gets lazy and doesn't update their website, that's a new opportunity for you! Every time someone gets their first credit card, that's a new opportunity for you! Every time someone decides to make their first internet purchase, that's an opportunity for you! Even within saturated markets there are always tiny sub-industries to get a foothold…another opportunity for you! There are so many opportunities to earn money through affiliate marketing, it really is the most exciting time to be a part of this industry. The internet cowboys of the past have blazed a trail for you. All you need to do is follow in their footsteps and start your training. It only takes that first step to begin the journey. Are you ready to take that step? Imagine how you will look back on this day in 12 months time. You will thank yourself that you finally made the decision to take a risk and invest in yourself. I've been a member of Wealthy Affiliate for 9 years now. Helping newbies get started is part of my daily routine. You can contact me with ANY questions you have because I'm logged into WA almost every day talking to people about their websites. Also, by signing up to WA through my website you will get a 61% discount on your first month of membership. That means your first month of premium will only cost you $19 (63 cents per day). Here's what the next page will look like. You can sign up, without entering credit card information. The starter membership is totally free, and you can try out many of the Premium features before deciding if you want to upgrade to the Premium membership. PS. Don't forget that you can always contact me for help or questions! Type “nathaniell” into the search bar in Wealthy Affiliate and leave a message on my profile. I log into WA every day to check my messages, and am looking forward to hearing from you! This is my current profile picture from 2019, so keep an eye out for me! Please let me know your questions or comments about my review or about Wealthy Affiliate below. I know it can be intimidating to start something new like this, and I'm happy to clear anything up. If you read to the bottom of the page here, it probably means you're interested, but also a little skeptical. So I decided to add a quick little section to my review showing what OTHER people have achieved in Wealthy Affiliate. I'm just a normal dude that stumbled upon a very cool way to earn money online…and I'm not the only one who's become successful with the help of Wealthy Affiliate. Screenshot from 2017 blog post. Highlighted text is my writing. Blue text are links within the blog post. But that was last year. What about 2018? The success train didn't stop. 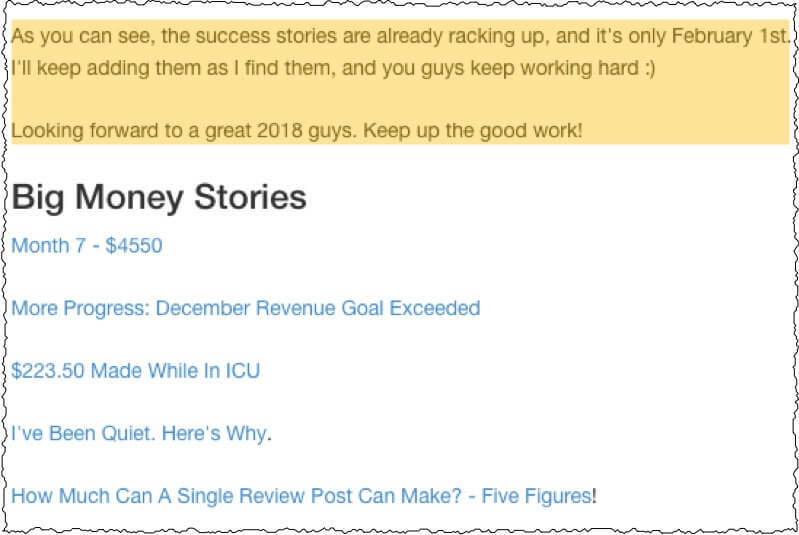 Here's an excerpt from 2018 succes​​s stories. When you sign up, shoot me a message and I'll send you a link to the full blog posts from 2017 and 2018! So what about now? Is affiliate marketing dead in 2019? Nope. Here's some recent success stories from Wealthy Affiliate (real people earning real money online!). Pretty cool, right? Keep in mind, these are normal people from all over the world taking the same training that you can start today. There's a TON of money being spent online, and right now is an incredible time to start a business. Is something holding you back? Let me know in the comments below. I check them every day and answer every question! I would like to have an honest response if possible. I am not interested in joining your program, I hope that’s not a problem. I have written an e-book on specific topic in the supplements niche, but I haven’t been successful in having it published, so I am wondering if I have a chance of earning some money by having a web site or a blog and posting it there in the form of articles. It has 30 pages I think (it’s not stored on this computer, I should look it up), but it is very specific, as I have mentioned, giving out valuable data etc. You can publish on Kindle very easily, and even create a physical copy through their program. 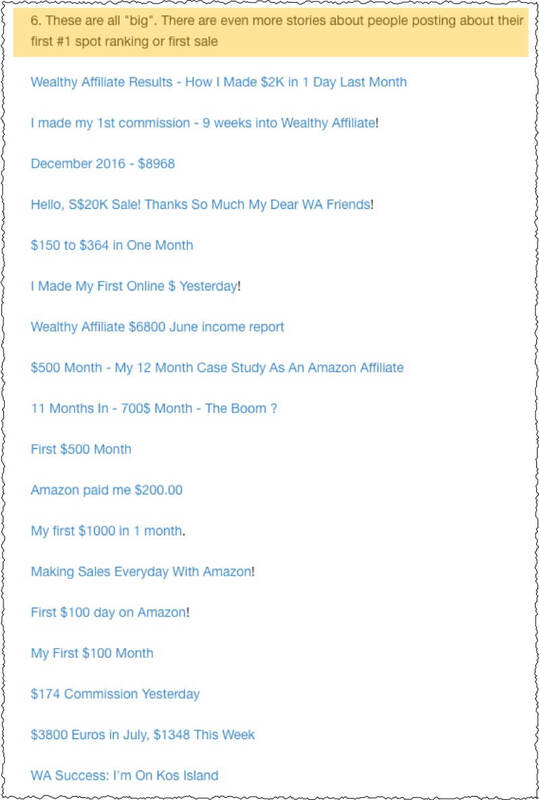 Why not start a blog, then drive traffic to your Amazon book listing? That’s the great thing about owning a website. You can send your traffic anywhere, even to your own product listings. You don’t have to be an affiliate, but you could add to your book sales income by promoting supplements as an affiliate. There are many amazing supplement affiliate programs out there worth promoting. Anything from brain supps, muscle supps, diet supps, etc, depending on what your book is about. This seems really interesting a d I’ve checked out a lot of money making sites. I work from day to day and can’t even make ends meet and provide for my family. With a family of 8 I’m the only income coming in well husband has liability bit that’s not much at all. I stay so frustrated and exhausted. Sounds like a tough situation Jamie. Building a business on the side would definitely be a way to generate extra income. However, keep in mind that only the STARTER membership is free. To be a PREMIUM member, the fee is $49/month. As you can see from my review above, it’s totally worth it, but not at the risk of taking food away from your family! I’m a 20years old boy,I want to make money but don’t know how or where to start,I need help from anyone or anywhere. The best way to get help is to help yourself! Use the resources on this page to start your business, and the community will help you out when you have questions about the training! Click the links on this page, sign up, and I’ll be able to help you out as you build and grow your affiliate website! Hey please help I really want to get into this but I don’t know alot like how to make my website,ranked up and so on so fill me in what am I supposed to do like where should I start from. The whole beginner training is about getting your website set up and understanding the basics. You don’t need to know anything to join and get started. I recommend clicking the links on this page then creating a username and profile in the Wealthy Affiliate community to get started! I tried affiliate marketing years ago. Back then I was just randomly posting ads online hoping to get sales. After about 4 months I had one sale and commission was $100. Well, I gave up on it. I went to eBay, ran a successful store on there for the last 8 months, sales totaled over $2,000 and my last month I had my biggest sales in a single month at $500, then BAM, eBay killed my account. Now, today, I’m back at looking into affiliate marketing and I need help with the fine details. I think I understand the big picture, but it’s the details I need help with. So, I make a website? Specifically, do I use some free service like Wix or should I use GoDaddy, and sign up for a domain name and build a website? What do you think of, or rather, what do customers think of being on subdomains? You know websites like mystorename.majorbrand.com? I also see you mentioned writing articles, and getting ranked on Google. I’m not familiar at all with getting ranked nor do I really understand what that means. So, am I writing articles and posting them on my new website or am I writing articles, putting them somewhere online then link them to my website in hopes of generating traffic? If you could help with these concepts, I would greatly appreciate it. Definitely don’t use a free service to build your business – you get what you pay for, and if you want a fast website that delivers reliable income, you need good hosting. There are many ways to do affiliate marketing. One way was the kind you learned, posting links and paying for ads. That can get super expensive if your links aren’t converting well! That’s why I recommend that you do “blogging”, e.g. writing articles as you mentioned. If you optimize your content based on search engine requirements (also known as SEO), you’ll rank on page 1 of Google. When someone searches a topic, your article turns up. They read the article, click a link, buy a product, and you make a sale. Hope this helps Jed. Let me know if you have any further questions! Wealthy Affiliate updates constantly. There’s even a LIVE webinar once a week so you are never far behind in knowledge about affiliate marketing and search engine optimization! Question for you Nathaniell, I’m 55 and own a small mattress shop. I’ve had a very difficult time keeping a job after being laid off from so many due to mergers, ascquisitions, change of bosses, change of company direction, etc… So I opened a mattress store so I can be my own boss and I do OK, but don’t think I want to be lugging around mattresses for too much longer even though it does help keep me young, muscles working and pretty fit. I want to get an affiliate site up and running asap, I”ve seen some affiliate mattress sites (some have TEAMS of testers/evaluators) I see/read a lot of articles on beds/sleeping such as tips before going to bed, sleep apnia, bed bugs, top 10 mattresses, Foam vs Hybrid, sleep disorders, etc… but I am not an expert on those topics. I have a couple domains, have a hosting company, and in the VERY beginnings of starting something-which means I haven’t started YET. I udnerstand how affiliate marketing works, but as I mentioned not an expert at those things, nor can I afford to bring in each mattress and try them out myself. Do you know of instances where people re-use or Is it possible to re-use other content as long as you give them credit? Can you tell me how will this service help wtih this… and, can you use reviews from other sites? It’s not possible to re-use other people’s content to build your own website. It would be like re-using someone’s book to write your own book. If you are not an expert right now, you need to become one! Everyone starts out as a beginner. Through research, writing, and learning you can become an expert in anything you want to. As long as you have an interest in the topic, the journey will be fun! If you can’t imagine becoming a mattress expert, then perhaps you should just pick another niche! There are millions of options related to mattresses that you could focus on instead. Some topics that would be less resource-heavy could be “how to get a better night sleep”, “how to become a morning person”, “natural alarm clock reviews”, “hypoallergenic bed linens”, and many more. hi, how long does it take you to write about a topic? is it one website per topic so 14 /mo. each.? It depends on the topic. Many topics I can finish in less than 2 hours, meaning I can post several times per day. More in-depth topics may take a week or more to complete writing, formatting, images, video, etc. The $14 price is PER YEAR, and that would be per domain you own. So the cost of running your business is $49/month + $14 per year, and that’s all you NEED. Of course, you can buy other stuff as well, but those are the minimum costs if you take the WA training. Ok…so…tell me if I’m wrong…. your “$10,000” a month income doesn’t really come from affiliate links that people click on from your websites and buy a product….it MOSTLY comes from the commission you make off of every membership to Wealthy affiliate you make from the links here huh? All of your other sites are basically a sort of front, in a way, that make up a very little percentage of your monthly income and are basically used as an advertising tactic to show people you have websites with affiliate links that make money so that they will sign up for a membership with Wealthy Affiliate. Also by telling people “it takes time to build up a profitable online business” will persuade them to keep there membership after 7 days and pay the 49 dollar month fee that you make money off of? So it is basically a “grow your team” pyramid type ell a membership scheme? Correct? Or am I completely off? You are 100% wrong. I ran sites in the VPN niche (computer software) for years before promoting Wealthy Affiliate. I sold those, and am now involved in other niches. I share some of those sites with more advanced members, but do not advertise them here, to prevent people from copying them. On top of that, my website here, One More Cup of Coffee, makes commissions from multiple companies. Not all are about affiliate marketing. Wealthy Affiliate is just, in my opinion, the best way for newbies to start a business. Would you rather join for FREE, then $49/month or start an Amazon business where the training costs $4,000 and you need an extra $500/month for inventory costs? Or what about a drop shipping business where you need to contact companies in China, then pay Shopify $100/month for hosting where they take a cut of your profits? Most people will choose the affiliate marketing route, where the startup costs are low, mistakes are cheap, and they can take the time to grow a business as a COMPLETE NEWBIE without risking a ton of money. Again. You are 100% wrong in assuming the bulk of my income comes from Wealthy Affiliate commissions. Just in case anyone, my commission is 50%, which is $23.50/month. For that price, I sometimes am in contact with people daily, helping them grow their affiliate sites in other niches. So I’m actually working to help people. I don’t think it’s weird to get paid for doing work. Do you? 1. I know you said all of the content of a website is mine, but would I own my own domain? (This may show my lack of understanding of website hosting etc…) If at some point, I could not afford the $49, would I have a chance to get all my content before they shut my membership off, so as not to lose my work? 2. I was thinking of creating a blog and doing affiliate marketing with that. Is that a smart idea? I was going to go to google domains and get my domain for my blog-should I do that and then go to WA for hosting? 1. Yes, you definitely own the domain (at least, for the year. All domains are registered yearly, so each year you have to renew. However, you can change your registrar at any point). 2. A “blog” is basically the same thing as a website. You are correct that a blog can make money with affiliate marketing. It’s exactly what Wealthy Affiliate teaches. WA hosting is included with their membership, so you can sign up to WA, host your website there, then move your website if you decide to cancel your membership. Easy! You mention several time about having to write alot? Are you talking about writing articles or content for a blog? Yes – writing “articles” is the same as “content”. Writing is the main method of gaining organic rankings in Google. You don’t have to be an expert marketer, or digital guru. You do however, need to be able to write a decent article about the topics on your website you make. This can all be learned through practice, and there are plenty of writing tutorials within Wealthy Affiliate. Your review is very great and helpful! BUT I GOT A PROBLEM. 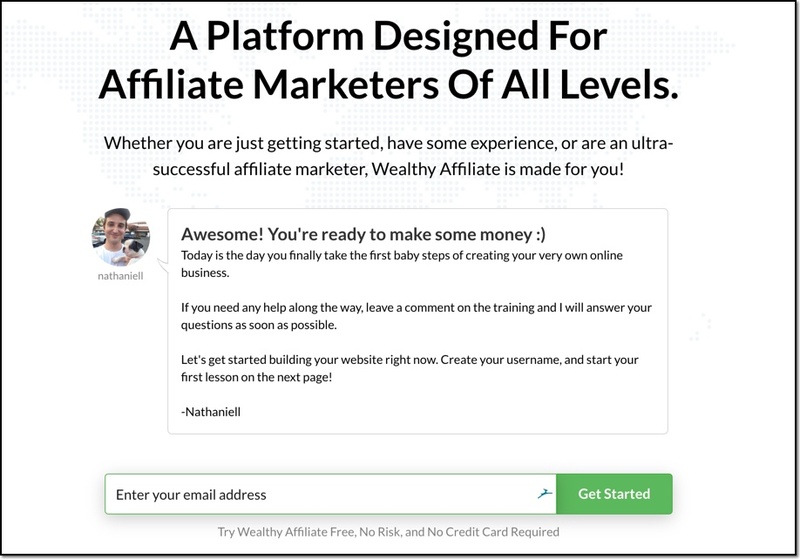 When I registered in the Wealthy Affiliate website, I am not getting any access to the website and when I clicked on the Dashboard or other buttons in the side menu, I got a pop-up showing the message, “Hey There Gaurav! Please help me Nat I also want the free membership of the WA. Please reply me as early as possible. Please tell me where I am doing wrong and How will I gain access to my 2 Free Websites. The free membership is not available to all countries, or perhaps your 7-day access to Premium has expired. If you’re in an approved country (most countries! ), you’ll be able to work on your website even after the 7-day premium expires, so what you’re seeing has to be because you’re perhaps from the Philippines, Nigeria, India, or Vietnam. Is it possible to join and make a steady income and then make the online income pays the membership? Would it be possible to use this technique in countries that PayPal is not used there? WA accepts credit cards as well as Paypal, so if you have a CC, you are good to go! That being said, some countries do not have access to the free Starter membership, namely India and the Philippines. I would be interested in the time commitment that you put in. In particular starting out and then to keep your sites relevant and current. In the beginning, I worked long days, writing 6-8 hours a day. 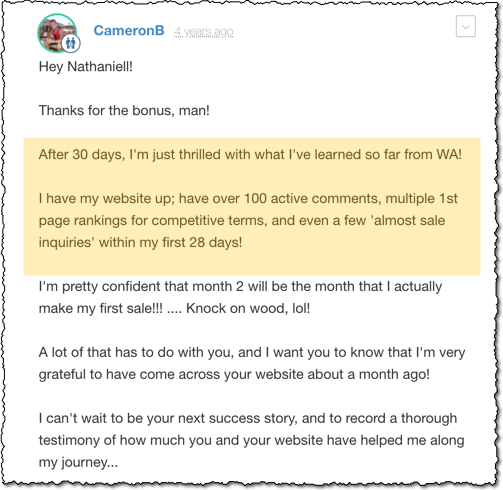 That’s why I saw results so fast ($10k/month after a year). You don’t have to work that hard, but the people who write more, see more results. Now I work much less. I try to put in an 8 hour day but with distractions, hobbies, etc I probably do about 3-4 hours of hard work per day. I’m trying not to get too lazy though, because running an affiliate website does take consistent work to stay relevant. It’s not a total “retire early and do nothing” type of plan. You gotta work to grow your business! I am concerned with the number of run on and on pages I see like this one. This takes lots of time to write this much. Precious time. If WA is so great, why do the affiliates try so hard to sell it? I am skeptical, but not closed minded to joining. Already a free member. No chat time left on my account. What would you have me do instead? Write 20 words and say “go buy it”? I’m trying to explain a new concept to people in a way that is easy to understand, yet comprehensive. Would you spend money on something you don’t understand? On the free membership you get a free subdomain, so it looks like mysubdomain.siterubix.com. This functions pretty much like a normal website, in that it gets listed by Google, you can add content, and make money from the links. You won’t be able to fully customize it with plugins though, and you won’t have your own .com domain URL. You retain ownership of all the content. When your 7 day trial is over, you can choose to keep working on the free URL until you decide to upgrade to premium, or you can move your content to another host using the export XML feature of WordPress. All of this is still 100% free! If you decide to upgrade, you’ll be able to move your freebie domain to a full .com domain name. That domain name will cost $14/year, which is standard pricing for domains. All the content will be moved over to that domain. Hosting is included for free in your WA membership. If you decide to leave WA, you can move all your stuff to a new host whenever you want. I hope this helps Sarah! Let me know if you have any follow up questions. It depends on the company. Some companies have many options, including Paypal and bank transfer, others do just one. Some will have the option to pay by cheque as well! Hope you and your family are doing great! Here is my question: “What do you know about ‘Jim Cockrum’s Coaching Course?’ I was debating, if it does not cost me “an arm and a leg” to join the course but then I start reading a few negative reports/reviews on “Ripoff Report” (old ones ) which made me slightly uneasy! Also, I noticed that apparently Jim and/or the “Coaching Office” is located in Utah! This makes me kind of uneasy also, because many Internet operators, companies , etc., are located in Utah! I happened to deal with a few of them and they all left me with a bad taste in my mouth and/or ‘burned’, so to speak!. Hopefully, you are able to give me some positive input because I value your opinion! Thanks a lot and GOD Bless! There will always be negative reports, especially from people that don’t take action and regret spending money, then expect a refund. You should investigate negative reports, but read them with a grain of salt. In terms of coaching, my advice is to try to go it alone for a while until you have specific questions you need to ask, and specific things that are troubling you in your business. Having a coach as a beginner is often a waste of money in my opinion, unless you have the cash laying around and really want to make progress fast. Most people do fine bootstrapping, then get a mentor when the hurdles start to get higher and more frequent. I already have a website and a domain name. My website is made with WordPress, and GoDaddy hosts the website. Would I have to move my website to another host, that is part of WA? Also I am thinking of keeping the website much the same way it is now(with a few changes). I already have a blog page, can I just add my links there? I have a gardening business, and I want to talk about ergonomic tools, pads, sun hats, shoes, bug spray, garden related art or jewelry, proper use of one’s body while gardening, getting the most from your gardening and achieving health and wellness through gardening. Not just the movement of digging, or hauling mulch, but with every technique I teach. Each technique also is a simile for one of life’s problems. Unfurling a plant that is root bound in it’s container, and preparing it for planting is like something that is keeping you bound, and cramped. It could be an illness, or lack of some knowledge, isolation, or another person. Is this too esoteric to include affiliated marketing? Is it too much to combine my affiliated marketing, with my actual business website? You do not have to move your host. There are benefits to moving your site to WA (lots of stuff to help your site rank and improve), but if you already have a site and want to keep it at other hosting/registrar, that’s totally fine. I think your niche sounds fine! Sounds like you have a specific audience in mind that can help you carve out a niche within the home gardening industry. Good job with branding Elise! Oh, and you’ll be fine to add an affiliate blog to your business website. That’ll help you with gaining momentum fast I think! You don’t have to buy stuff to review it. Very often, a great researcher and writer can come to a more clear and academically sound conclusion than a newbie person trying to write about a product they don’t fully understand. Do your research, and you’ll be fine! Ok so I’ll bite. Tell me why someome that searches for any kind of product wouldn’t just go to the direct supplier rather than filtering through a long winded site to eventually click on an affiate link? If one happens to fall upon someones website as result of a search word only to discover an implanted link takes them to the actual seller, what keeps them from exiting their website and then going directly to the actual seller’s site, such as Amazon for one? I do this all the time. Great questions Ken, and common ones! Firstly, not everyone searches “buy product X”. Most people search for “how do I….”, or maybe “what is…”. So if someone searches “how do I replace the water filter on my refrigerator”, they can find your how-to article. In the article, you explain how to do it, then link to the water filter they need. Secondly, Most people will be too lazy to purposefully leave your site, then go do Amazon and find the filter you pointed out. They’ll just click your link, go to Amazon, and be done with it. Some people do this, but they are in the minority. Similarly, if someone searches for “what is the keto diet”, then finds your article explaining it, they may get interested. From that interest, you can recommend a beginners book, a recipe book, or an online community of keto-friendly people. So, many of the searches you’re catering to are not just a replacement for the vendor’s website. They are helping people understand topics, and recommending products/services to help the reader. Even something as simple as “Product X v1 versus product X v2” is a great way to inform customers about products, get clicks, and make sales! Yes, if you stop paying your subscription, you’ll lose access to the support and training at WA. It’s like a gym membership – imagine you stop paying the gym your membership fees. Would you still be able to work out on their equipment? Hi I just have a few questions. 1. Can I cancel at any time once I join? 2. Would I have to buy products to test to be able to review them? That would be very costly! 3. Are there ANY added costs to use certain tools once you get in to WA? 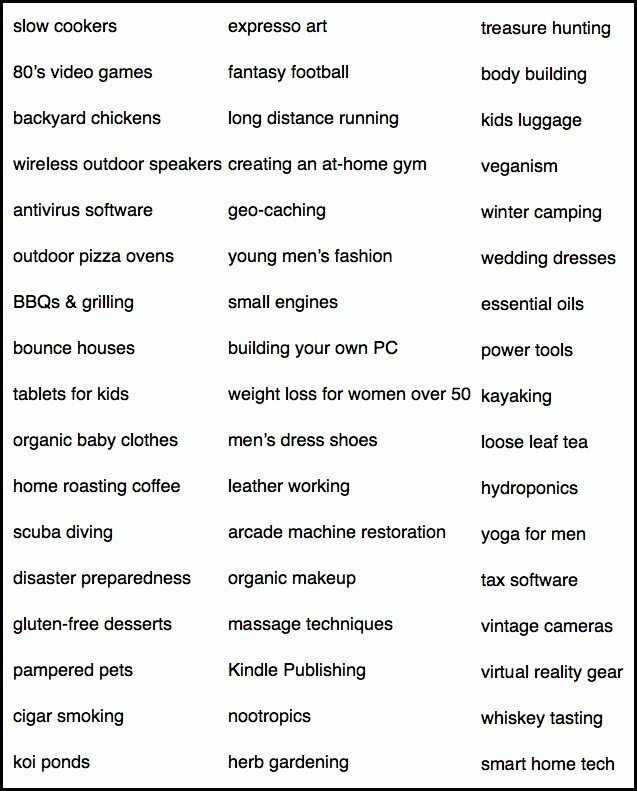 Besides what I just read about keyword search for 19 per month. Hidden fees? 4. If my website is about one topic, will I end up with several website domains at $14 per year? Or can I have one generic website that lists topics and reviews? Thanks for your time. I’m sure I will have more questions pop in soon! 2. No, you can use research in lieu of personal experience. 4. You should have one focused topic. It would be weird to read a website about mushroom harvesting and puppy potty training on one site. Segment your audience! Hope these help Dawn. Sorry for the delay in response! I’m a single mom and had been laid off several times from Oil and Gas Industries. I’m looking for something legitimate and long term work to earn steady income. Even not having any experience in creative writing, is it something I could do? In addition, I’m in my late 40s. Do you think I still have a chance? Anyone can do it. I know a homeless lady that created income from her friend’s couch. If you don’t have the skills needed like writing, reading (research), or web skills, you NEED to be patient enough to sit down and learn the skills. If you have kids, I’m sure you know a lot about patience! LOL. Anyone can do this if they put in the time. It may take you longer than others, but it WILL happen!